• Reed is the only undergraduate college in the country with its own research nuclear reactor. The reactor is used for science courses and senior thesis research and is staffed primarily by undergraduates. Reed has more licensed student operators than any college in the world and more licensed female operators than all other research reactors combined. • The College offers a Bachelor of Arts degree in 26 departmental majors, 16 interdisciplinary areas, and dual-degree (3-2) programs in Computer Science, Engineering, Forestry, and Visual Arts. • Among all institutions, Reed ranks fourth in the nation in production of future PhDs in all disciplines. It ranks second in the nation in life sciences and third in the nation in social sciences (source: NSF WebCASPAR; data compiled by HEDS). • Graduate schools most frequently attended by Reed alumni for Law, Medicine, Business, and other graduate study include the Universities of Chicago, California, Oregon, and Washington; Yale; Harvard; Stanford; Cornell; MIT; and Johns Hopkins. • Reed has produced the second-highest number of Rhodes Scholars from a small college (32). 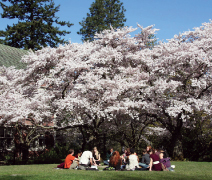 Reed College is located 10 minutes from downtown Portland, Oregon, a vibrant metropolis of waterfalls, bridges, and parks of every size. For more than a century, the College has been a haven for a diverse group of scholars who wrestle with big ideas and explore ways to apply those ideas to the world aroundthem. Learning is cherished at Reed; it isn’t outside the norm to talk about your passions and discoveries. If you’re ready to look beyond the superficial, to seek thetruth and discover unlimited possibilities, you’re ready for Reed. With a student-faculty ratio of 9:1 and all classes taught by professors rather than teaching assistants, undergraduate education at Reed comes first. The conference method of learning brings together small groups of students to discuss great ideas, read primary texts by leading thinkers, and form opinions and defend them with skill and nuance. Guided by a thoughtfully constructed sequence of topics and architecture of ideas, students map an academic course that culminates in the senior thesis. They work alongside their professors, with whom they share a deep enthusiasm for scholarship, inquiry, and academic excellence. Asking questions is a social activity for Reedies. You’ll overhear heated debates about Plato in the Sports Center and get caught up in string theory on the Quad. Whoever you are (even if you’re still deciding who that is), you’ll find that the Honor Principle supports differences and creates respect within the Reed community. Reed is a humanizing place of infinite subsets that offer you the opportunity to be yourself acrossall your interests. You’ll find your tribe in the classroom, exploring Reed Canyon, or hiking in the Cascade Mountains. Four years of college can seem likea long time and paradoxically like notime at all, but your time at Reed will leave an imprint on you that will extend throughout your life; once a Reedie, always a Reedie. Exposure to the primary disciplines of human knowledge prepares graduates to goon to fascinating professions in science, art, medicine, global politics, education, and the environment. 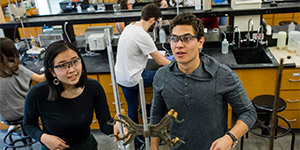 Reed ranks among thetop undergraduate institutions in the nation in the percentage of graduates going on to earn PhDs in Physics(ranked #3) andthe life sciences(ranked #2). While there is a robust outdoor program, a recently renovated sports center, and a long tradition of club sports at Reed, there are no varsity athletic teams. Campus social life is open to all, with no exclusive clubs or organizations; there are no fraternities or sororities at Reed. Some of our organizations include the Black and African Student Union, KRRC-FM (the campus radio station), a constantly growing comic book library, Oh For Christ’s Sake (Christian organization), Chabad (Jewish cultural organization), The Creative Review, the Feminist Student Union, and the Bike Co-op. The Office of Inclusive Community (OIC) seeks to sustain a campus environment that is welcoming and supportive for all students, staff, and faculty. The OIC has a particular investment in making sure the community is open to students interested in opportunities for identity exploration. This is accomplished through developing educational and social programs that facilitate dialogue and address issues of class, gender, race, religion, sexual orientation, and diverse social perspectives. The Multicultural Resource Center (MRC) provides a supportive place for people of color at Reed and a space for all members of the community interested in exploring multicultural issues. In fulfilling its mission, the MRC hosts events and sponsors student-initiated activities. It offers a library of diversity-related books, music, and videos and supports activism related to social justice and human diversity. The operation of the space and its programs is supported by student staff and two professional staff members. The Peer Mentor Program (PMP)assists first-year and transfer students with their college transition by pairing them with a peer mentor who provides guidance and supportthroughout the mentee’s first year at Reed. PMP seeks to support students from underrepresented communities and encourages the development of spaces for students to engage in conversations about the impact of diverse perspectives on the educational experience at Reed. Over half of Reed students receive financial assistance from the College. A full need-based financial aid program makes Reed accessible to students from a wide range of economic backgrounds. The College guarantees it will meet 100% of demonstrated need (based on the FAFSA and CSS/Financial Aid PROFILE) for all admitted students who file their financial aid applications on time. For the 2017–2018 academic year, the average financial aid package (including grants, loans, and work-study opportunities) was approximately $45,325. Reed welcomes applications from freshman and transfer candidates dedicated to the pursuit of a liberal arts education and a rigorous academic program. The College is committed to maintaining a student body distinguished by its intellectual passion yet diverse in its range of backgrounds, interests, and talents. We accept the Coalition Application and the Common Application with a short Reed supplement and do not charge an application fee. The Office of Admission is open Monday through Friday from 8:30am–5:00 pm (Pacific Time) all year, except for major holidays. Students mayapply online at reed.edu/apply.